It’s a worn-out cliche these days to say that a game is “perfect for the Switch,” but that really does apply to Captain Toad: Treasure Tracker, which will become the latest Wii U transplant to arrive on Nintendo’s new console this Friday. I admit that I didn’t think that Captain Toad, originally released in 2014, was a strong candidate for a Switch port. It was a clever puzzle game based on the side quests from Super Mario 3D World in which the jumping-deficient Captain had to navigate rotating, cubic worlds to find treasure and escape with all his spores intact. The original game could be completed in a few hours’ time and didn’t make that much of a splash on release. This piece originally appeared 7/11/18. We bumped it today for the game’s release. A bigger obstacle on the road to Switchville was that the levels featured lots of tightly-woven integration with the GamePad, which was required for play. To my surprise, Nintendo redesigned or removed those elements in order to get Captain Toad off the Wii U. What Nintendo’s done here doesn’t change the fundamentals of the Captain Toad experience, but it does bring welcome changes and additions that make this the definitive edition. Bye-bye, blowing. The original game had platforms that could only be moved by blowing into the microphone of the Wii U. The Switch tablet has no microphone, and anyway how would you play this on the TV even if it did? Captain Toad handles this in the best way: By removing these blocks from the design of the levels and replacing them with other types of platform. Hallelujah. Four new Mario Odyssey-inspired levels. Once you cleared the Wii U game’s three main episodes, Captain Toad gave you a bundle of “bonus” content, including four levels taken out of Super Mario 3D World. These were probably the weakest part of the game, since it could be pretty boring, waddling little jumpless Toad through these lengthy, wide levels that were originally designed for four players wearing cat suits. Here, they’ve been replaced with four levels inspired by (but not taken directly from) Super Mario Odyssey. These are actually pretty cool, with some smart puzzle designs that call back to classic Odyssey moments. This is the extent of the new content in this release. Two can play at this game. Captain Toad on Switch introduces a two-player mode in which one player controls Toad with a horizontal Joy-Con and the other player controls a cursor with a vertical one. The second player can take over some of the tasks: rotating the world with the right joystick, or using the cursor to reveal hidden coins or stop enemies from moving. The real power of the second player is the ability to throw turnips anywhere, any time. That gives two players a big advantage, since the second player can now smash bricks, kill enemies, and accomplish other actions that wouldn’t be possible in the single-player mode without pulling a turnip from the ground first. Full disclosure: I tried out this mode by myself just to confirm what each player can do, and inadvertently discovered that it’s actually not that difficult to just play the game by yourself in two-player mode, with one hand on each Joy-Con. Considering the advantages it offers, you might try it! Other than that, Captain Toad on Switch is pretty much identical to the Wii U experience. (There’s also a version for 3DS coming out on Friday, but I wasn’t able to try that prior to release.) 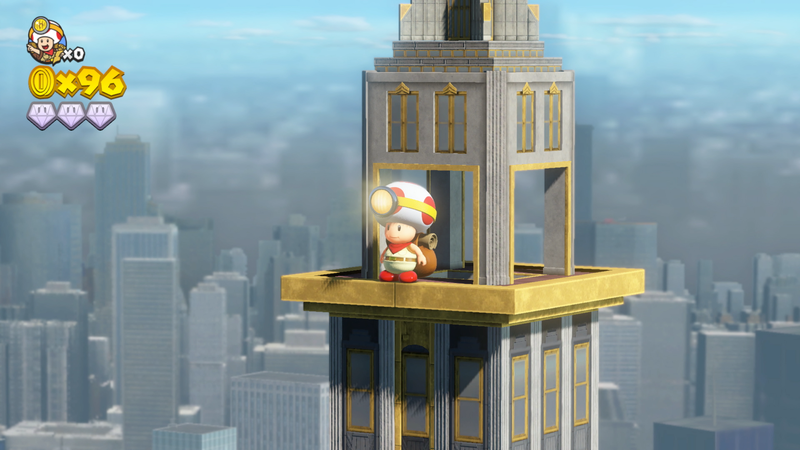 If you’ve never played Captain Toad before, be aware that it is a fairly short and simple few hours of gameplay, which the game pads out by making you play the same levels a few times over to get all of the optional collectibles and to solve a secret objective that you probably won’t hit your first time through. It is, nevertheless, a unique and fun gameplay concept with many clever ideas. If you already played the first one, there’s not that much new content here for you. If you’re a big enough Captain Toad die-hard that you’re considering double-dipping just to see the four new levels, just be aware that you’ve got to play through the whole game again just to see them, and not that much really changes besides not having to spit all over your GamePad anymore.